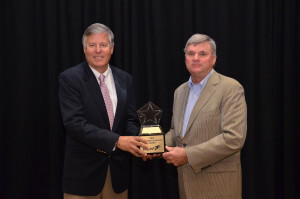 Earle W Noyes & Sons Vice President of Sales Don Olen and President Peter Noyes accepted the United Van Lines’ President’s Quality Award at United’s annual convention. The award recognizes the top service performer in the carrier’s U.S. family of affiliated moving agencies. ST. LOUIS (November 10, 2015) – Earle W. Noyes & Sons Moving Specialists, Portland, Maine, received the 2015 United Van Lines President’s Quality Award, which recognizes the top service achievement in the carrier’s U.S. family of affiliated moving agencies. The selection of Earle W. Noyes & Sons was announced by United Van Lines CEO Jim Powers at the company’s annual convention in Scottsdale, Arizona. Earle W. Noyes & Sons is now the 20th recipient of the annual award, as well as a two-time winner. They also received the award in 2009. The company earned the recognition both times on the basis of its quality service as measured by data generated through a comprehensive survey completed by customers after the move.